Properties in Bad Ischl average 4.6 out of 5 stars. Mountain panoramic view - central location in private park. Last minute offer! Property 28: Mountain panoramic view - central location in private park. Last minute offer! Property 38: Farmhouse with "rustic atmosphere"
House - House Borth - dream at the Traun! Property 42: House - House Borth - dream at the Traun! 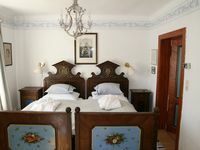 The house is charming located 5 minutes from the center of Altaussee and a quick walk to the lake. Beautifully decorated in the Aussern syle, it takes one back to another time. The view is spectacular over looking some of the most glorious mountains in the Alps. The owner has covered all the necessities one would need on a trip. Next trip I will definitely rent again.